JapanUpdate.com has recently completed its most ambitious project yet--the Island Market Forums. The Island Market Forums is a communication platform allowing our visitors to ask or answer questions, hold conversation, discuss, debate, or simply share their feelings with others in a semi-real time environment. Many different topics of discussion are currently available and have already been actively used during their first week online. Check it out today at www.japanupdate.com/forums. Some of the most popular topics up to now include news & politics, dating & romance, friendship, and religion & beliefs, but there are over twenty separate forums already available for our visitors to choose from, and more will be added in the future to meet the demands of our visitors. In fact, if you have any topics you'd like added to the current system, simply send an email to webmaster@japanupdate.com. 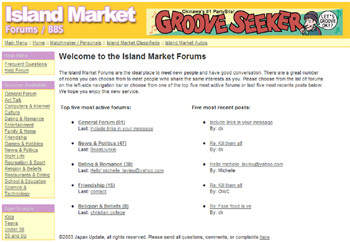 The Island Market Forums has a very user-friendly interface which allows our visitors to quickly browse through a wide range of topics and messages. Visitors are also able to post their own messages or reply to previous posts. This is a completely free service and no registration is required, thus allowing our users to post in complete annonymity. Though just over a week old, the new Island Market Forums has already achieved great popularity amongst our regular visitors, and it won't be long before this becomes JapanUpdate.com's most popular service. In the near future, Japanese language support will be added to the forums, and many other improvements will constantly be added. We at www.japanupdate.com and Island Market hope you will use and enjoy our new Island Market Forums. If you have any questions, comments, or suggestions, please send an email to webmaster@japanupdate.com. Check out the Island Market Forums at www.japanupdate.com/forums! Special thanks to CJ of ORO (www.OkinawaResource.org) for his help in writing an intensive how-to manual for the forums.